This week, let's take some time to take a look at one of the earliest (in terms of timeline) appearances of the main villain of the final arc. She is none other than Nagi's ultra-violent and super greedy cousin, Hisui Hatsushiba. Based on appearances and context clues in the manga, it can be surmised that Hisui is probably around the same age or possibly even younger than Nagi. 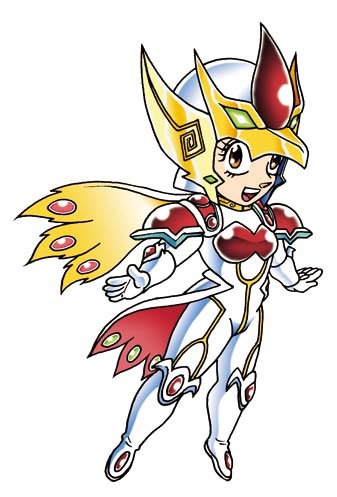 She is the elder sister of "Jenny" who looks nowhere near her age based on Nagi's recollections at the time that she found Tama. Also, there seems to be little family resemblance there. Hisui's face may look menacing, but she's also petite (a little bit shorter than 14 year-old Nagi), has the same body type as Nagi -- and if you really look at her, she's actually pretty cute. Furthermore, Hisui is an expert hand-to-hand combatant and seems to prefer wielding a scimitar in a fight. She is able to stalemate Hayate when he is actually being serious before she gets her huge power-up in the final arc that basically makes her "the strongest" according to Himegami. In any case, that's enough about that Hisui -- right now, we're going to look at the Hisui from an earlier time. From a time when she was just Nagi's childhood friend -- albeit, still one with hyper violent tendencies. Still, many people seem to misunderstand her character and count her off as nothing more than a cookie-cutter villain. Therefore, this week, Hayate Reflections seeks to challenge that viewpoint. For this reason, we're using chapter 529. This is a flashback story and it begins with Nagi reflecting on how much of a weak crybaby she was when she was much younger. Some boys had made fun of her manga and she was walking off alone -- crying. That's when Hisui asks her why she was crying from way up a tree. Nagi is shocked to see that Hisui had climbed so high up, but she replies that the view from there was breathtaking. 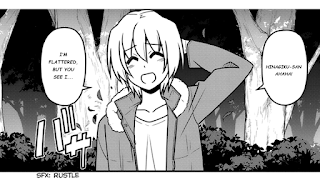 Nagi tells Hisui about what happened and that's when a group of four boys from the party appear before Nagi and start bullying her about her manga again -- even snatching it out of her hands in order to make more fun of her. When one of the boys shoves Nagi, Hisui decides that she'd seen enough and catches her friend from behind. She also quickly snatches the manga away from the bullies and gives it back to Nagi while telling her that if she doesn't like something, then she has to fight. Now the bullies, being bigger and older decide that it's fair game to punch a girl -- and so, the biggest of them smacks Hisui right in the face. So at this point... this is the point of dissent between myself and most other reviewers of this manga. At the time this chapter came out, all that people were obsessed with was how extreme Hisui's response was. For me however, this was the first time that I saw a more human side of Hisui and this was the chapter that elevated her from being more than just a mere cookie-cutter villain. Also, I believe that the ending -- chapters 567-568 prove my point. 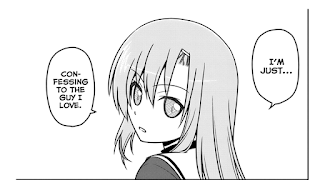 Hisui was still Nagi's friend even after she'd resigned herself to being a true villain and she was instrumental in giving Hayate's parents the poetic justice they deserve. In any case, what happened next is that Hisui basically picked up a giant rock as an equalizer and proceeded to beat the living hell out of those four boys. Hisui reiterates that if you don't like something then you have to fight. Nagi is hesitant because she says that stuff like this will happen (getting punched in the face) if you try to fight back... but what Hisui says next is really iconic. She says that it's fine, then you just have to keep fighting until you win. 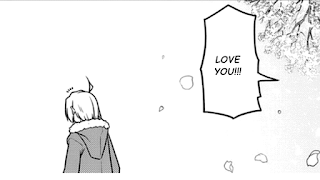 So yes, Hisui basically beat everyone up in a very bloody manner off-panel -- however, despite the violence, it should be noted that Nagi's feelings at that time reflect the real message of this chapter. In her own words, watching Hisui beating everyone down by force -- all she felt was admiration. So allow me to explain -- Hisui represents an indomitable will to fight back against adversity. She was facing four bullies, boys, bigger, older -- and probably stronger than her, but she refused to give in because she knew that her cause wasn't wrong. She did it not only for petty revenge, but in order to show Nagi the value of standing up for one's beliefs no matter the odds. 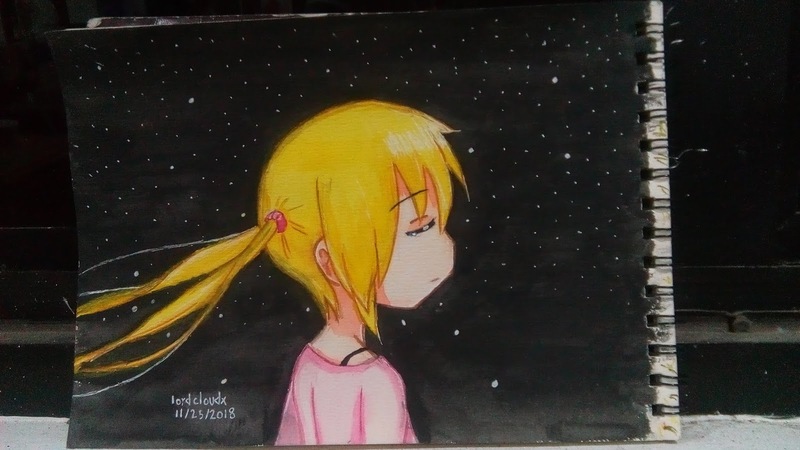 Certainly, this indomitable will would one day become an omnipresent trait in the spoiled, rich Nagi Sanzenin ojou-sama that we came to know and love in the series. Of course, Hisui's character development is still shaky at best. Because of how rushed the ending was, various characters and subplots weren't really given the chance to fully develop -- and unfortunately, Hisui was one of the unfortunate victims of Hata's non-stop train ride to the Hayate and Nagi ending. Still, it is worth noting that even as she is, she wasn't really a bad character-- just that her potential was never fully explored in the story. So that's Hisui Hatsushiba for you. A villain through and through -- but also someone who stays true to herself and makes no compromises to get what she wants -- at least that much about her is admirable. Also, she's cute. 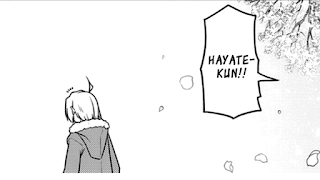 Even Hata-sensei agrees. 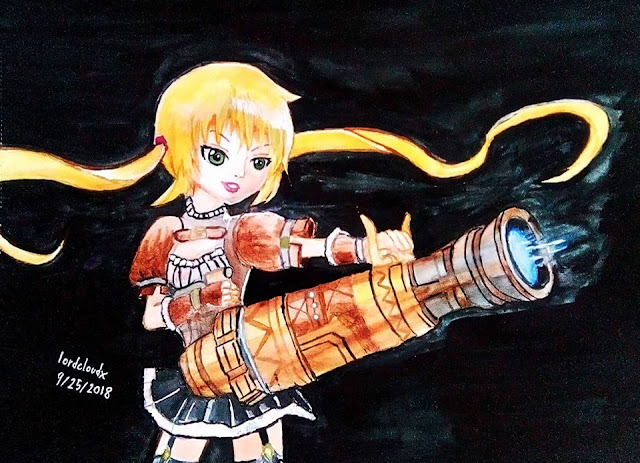 Got some new fanart to show off. These are both inspired by Avril Lavigne's new single PV Head Above Water. Heh, I've always liked her music and she's not bad looking either. 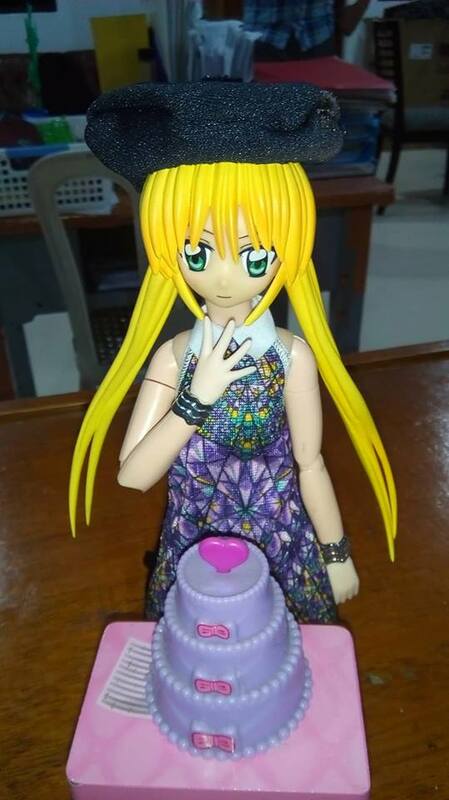 Naturally, I would never forget mai waifu's birthday. Also, my tweet got noticed by Hata~ Huzzah! Anyway, see you next week. Here's my painting process of a HayaNagi pic for Nagi's birthday. I've been absent for quite a while due to IRL stuff. Anyway, I haven't had much time to continue my fiction mini-series (conclude, actually) but that might change this weekend. For now, I hope you'll settle for this short video. Berkeley Watercolor Pad. 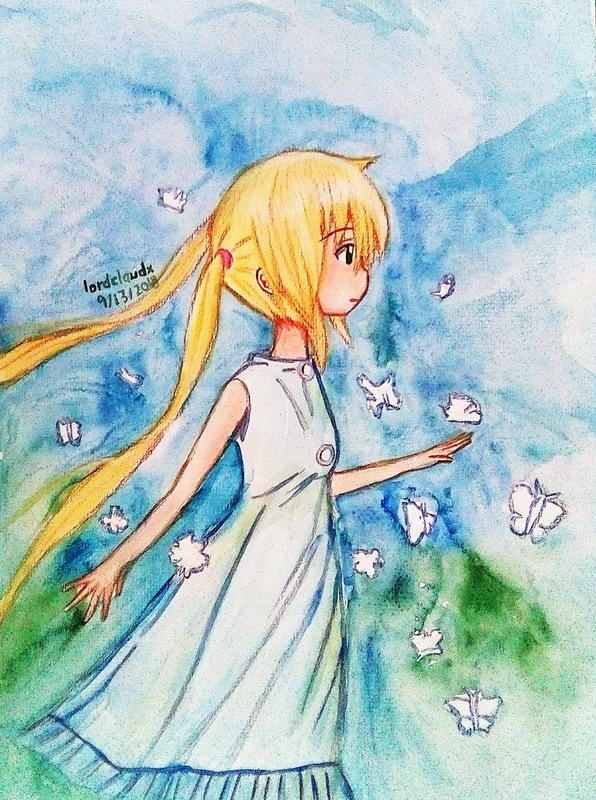 I don't think this is artist grade, but I have no idea what brand of watercolor paper I should use anyway. 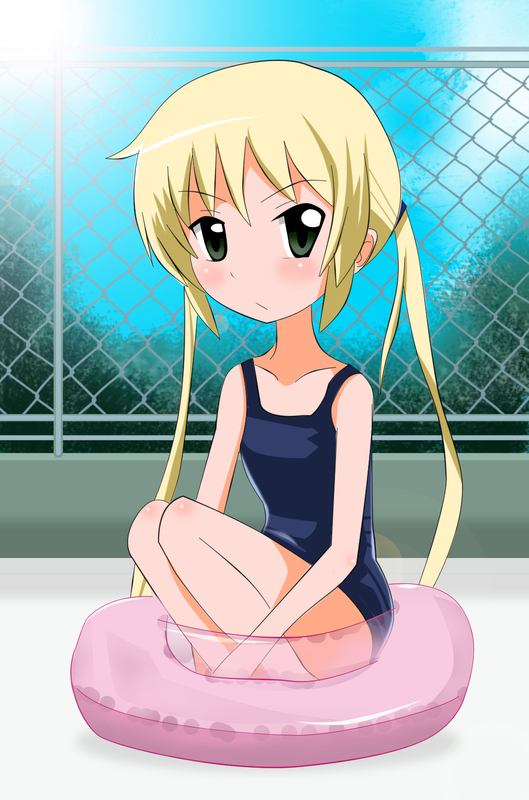 November 11 is Hayate Ayasaki's birthday, btw. Happy birthday, ex-butler and Nagi's lover. It is very confusing in the forest of lies. It is different for everyone who ends up inside. It is a forest that reflects the inner truth – the ones that most people try their hardest to hide. At this point in the prince’s journey to find his would-be bride, he found himself in the deepest part of the Forest of Lies. He had been walking for quite a while with his trusty steed by his side. Finally, he understood the words relayed by the knight of red and white. The voices were quiet at first – ever so slight, but slowly, they grew louder, like insect wings in flight. “Who do you love?” The voices asked in mischievous delight. “It is none other than the princess in black attire.” Was the prince’s prompt reply. The prince was at a loss. He knew that they were right. Just what is it that he actually loved about the princess in black attire? At that moment, as if to clear his mind, a single flower floated down from the sky. It was pretty and frail with petals of yellow and white. He closed his eyes for a moment, waiting for the noise to subside. And that is when it dawned on the prince with a beautiful face; the reality of the truth that he had to embrace. At that moment, he looked to the path ahead with unclouded eyes. He could no longer hear the voices in whispers so slight. He had found his way past the forest of lies. This is the truth of the Forest of Lies. It is simply a reflection of what you truly feel inside. 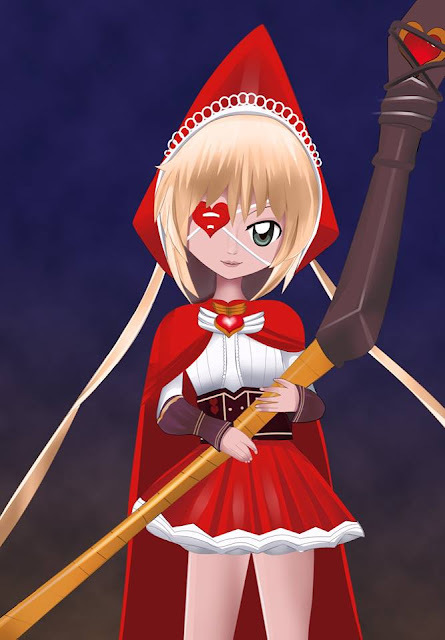 Here's my digital version of Nagi as Ruby... not too sure if it turned out so well. 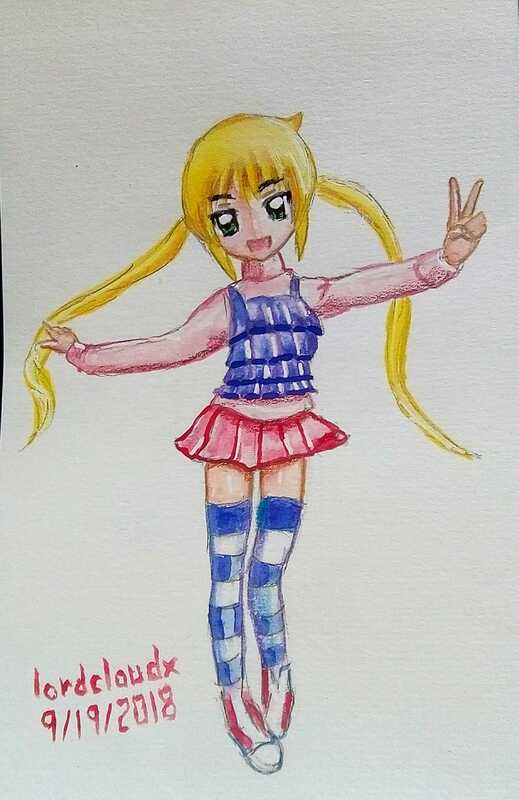 Should have used a more 2D anime style. 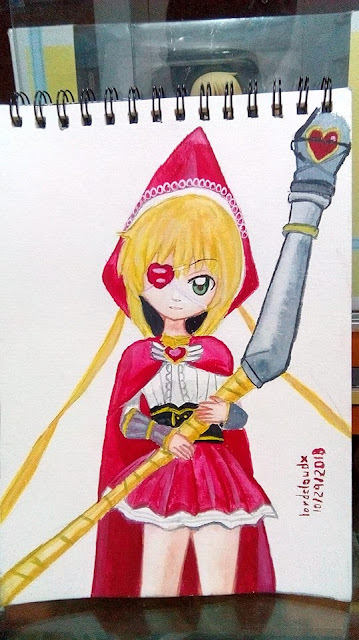 I've been a bit busy this week, so no new essay, but here's a video of me painting Nagi as Ruby from Mobile Legends. Just finished catching up with all the currently scanlated chapters of Hata’s new manga, Tonikaku Kawaii. It’s now up to volume 3, so if you feel like supporting the author of Hayate no Gotoku!, go ahead and order the manga online through your favourite hobby supply store. 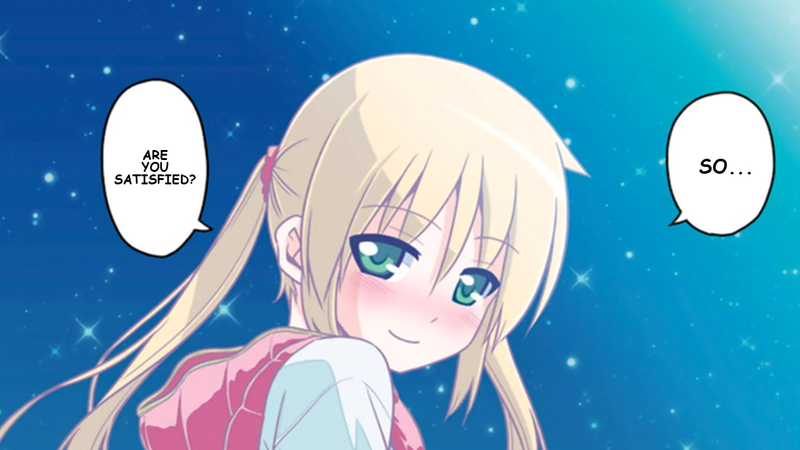 Anyway, this week, I’d like to talk about my general impressions of Tonikaku Kawaii in relation to Hayate no Gotoku! First of all, I must say that it’s a nice change of pace. There’s the fact that the romantic relationship between Nasa and Tsukasa is established from the very beginning and that no misunderstanding exists between them. The only real mystery is Tsukasa’s true identity and/or what she really is because there are hints that she might actually be thousands of years old. However, as to the two main character’s feelings for each other, it’s established from the start that there is romantic attraction between them, although at this point, I wouldn’t call it love yet. Actually, what they both admit is that they find each other cute – as per the title of the manga. He has done a lot to try and prove his love for Tsukasa so far, but at this point, while the couple’s feelings for each other have not been really put to the test, I’d say they’re still a step behind what Nagi and Hayate had for each other at the end of Hayate no Gotoku! It’s not about how many dates they’ve been on, or a matter of how many romantic moments they’ve hard with each other. If an author’s idea of love is that it is to be counted based on quantifying the number of romantic moments that two people have had with one another, then I would stop reading anything ever made by that author – fortunately, Hata is not like that – at least based on my personal perception. 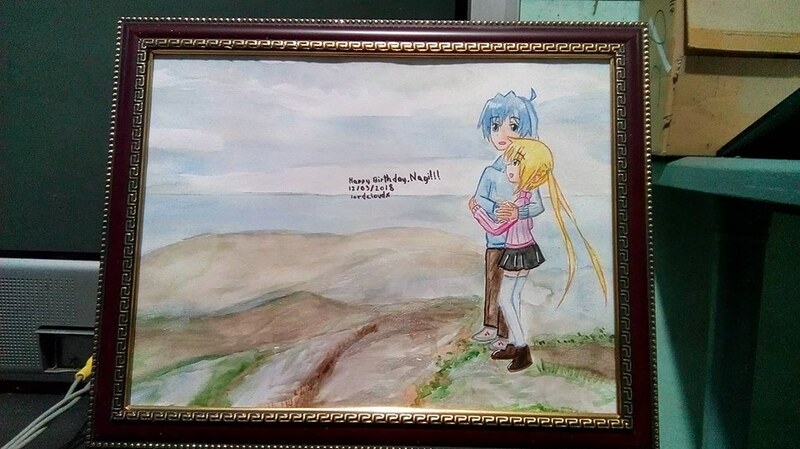 The fact of the matter is that the feelings that bound Hayate and Nagi was put to the test time and time again and at the end of the series, that bond was alive and stronger than it had ever been – that much, not even haters should deny – but they will. Anyway, moving on, so far Tonikaku Kawaii is definitely a much lighter story to read than Hayate ever was. This is because there is no looming “bomb between them” that threatens to end in tears. With Hayate and Nagi, the misunderstanding between them was established from the very start, and then Hata kept on adding one complication after another into the plot – some of which were never resolved, but most of them, just adding on to that feeling of dread that either Hayate or Nagi would be seriously hurt once the big revelation came about – as it did in the final arc of the manga. 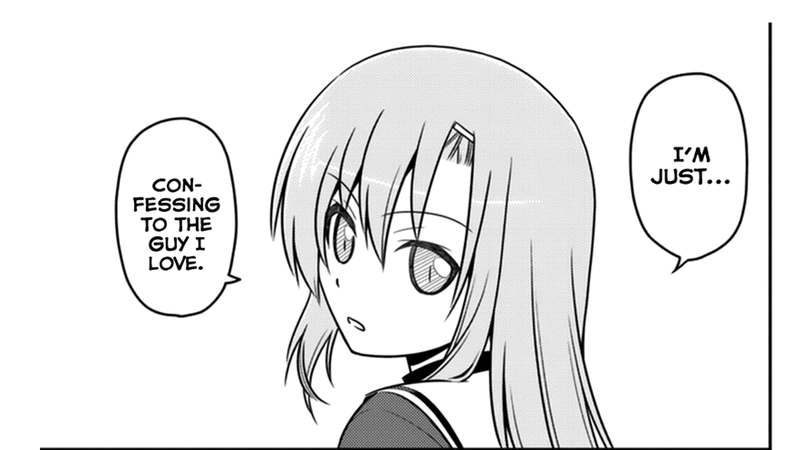 In the case of Tonikaku Kawaii, it seems that Hata took a route that can be pretty much seen as an antithesis to Hayate. First of all, the couple are already married and romantically involved with each other from the start. Secondly, any complications that try to set them apart get resolved almost instantly. There’s Nasa’s neighbour who had a crush on him and was quite dense and thought that Tsukasa was just his relative and that’s why she had the same family name as him. However, in the most recent chapters, she found out that they were married and her moment of heartbreak lasted for about one page. Nasa’s parents already accept Tsukasa and are very glad that their son chose to marry the person who saved his life. Quite the opposite of Hayate’s good for nothing parents. 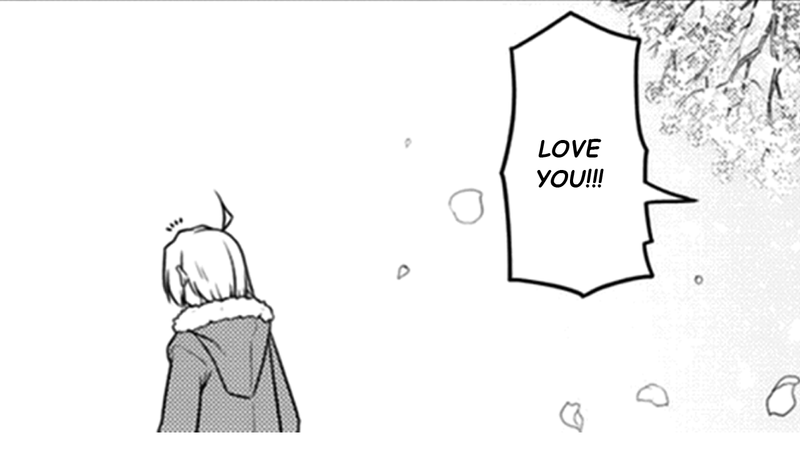 Finally, there’s Tsukasa’s non-blood-related younger sister who was concocting one scheme after another to get them to break up, but in the latest chapters, Nasa used his first-class communication skills (and sincere feelings for Tsukasa) to get her to accept him – possible complication solved. 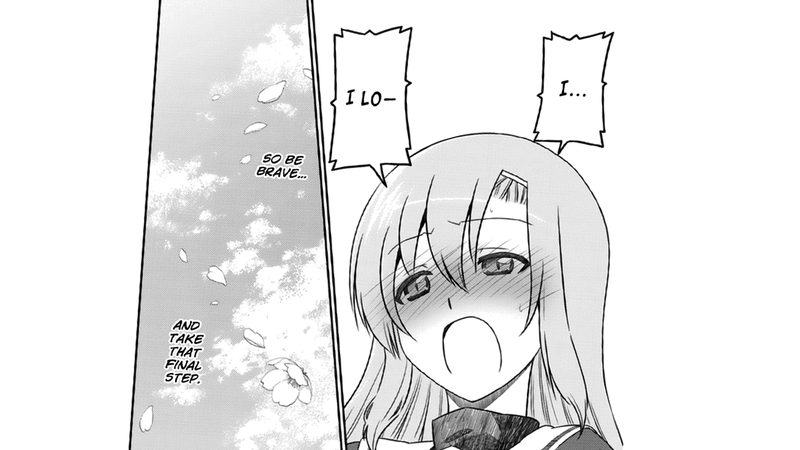 If you were reading Hayate and got super frustrated by all the complications that Hata threw into the plot just to prevent Hayate and Nagi from getting together, then you’ll find that Tonikaku Kawaii is a breath of fresh air that presents the reader with a lot of similar situations, but which are resolved in a way that just makes you feel good. If Hayate no Gotoku was about building up anxiety under the façade of comedy, then Tonikaku Kawaii is the true definition of comedy, one that gives you a good laugh and also has you rooting for the main couple as they prove their love for each other no matter what complications may come their way – at least for now. Anyway, this has been Hayate Reflections and this is lordcloudx out. 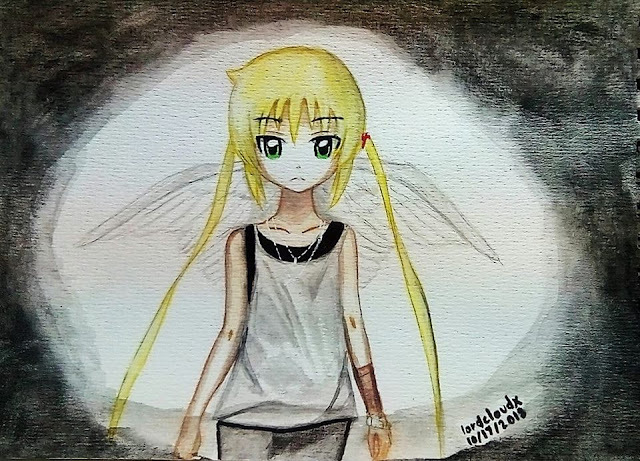 It's Halloween month, so have a dark angel Nagi. 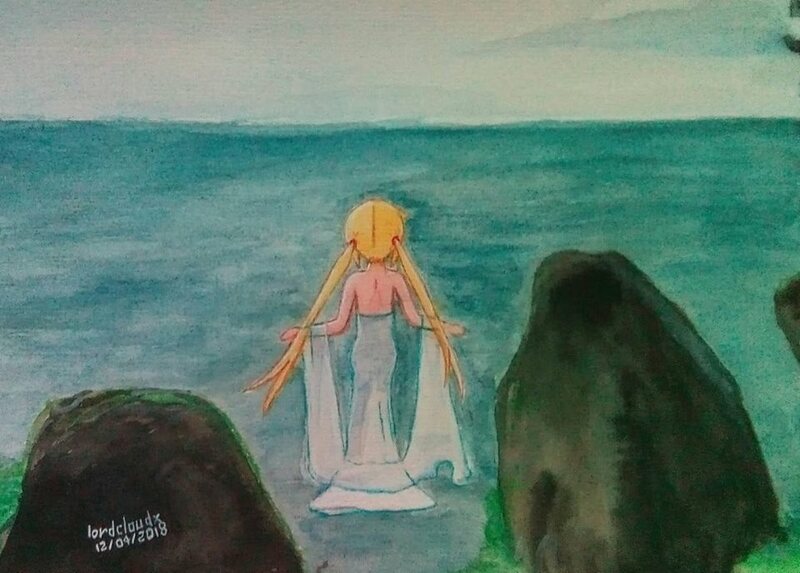 Inspiration for this piece came from the video for Ed Sheeran's "Give Me Love." Look it up on youtube and you'll see what I mean. It had now been quite some time since the beautiful prince entered the Forest of Lies. There were rows upon rows of tall trees whose branches filled the sky. What is more, the scenery seemed to look all the same after a little while. Still, with one goal in his mind, the prince kept riding straight forward without even batting an eye. But even so, even with his strong desire to be reunited with his would-be bride. Even the resilient prince soon grew tired. He shouted out to the branch-filled sky, but only the echoes of his voice came back in reply. Soon, even his trusty steed, could no longer sustain its powerful strides. It slowed down to a walk, it was obviously quite tired. The prince dismounted from his noble ride. A contented snort came back in response from the horse with fur of black slashes on pure white. The journey had been a long one and its eyes were beginning to shut tight. And with one last snort, the horse keeled over on its side. Within its once fiery eyes, the light had finally died. Suddenly, a lithe figure with a reddish cape, clad in chain mail of red and white, fell from the sky from such a great height. The prince jumped up several feet high, and snatched the falling figure from right out of the sky. The prince put her down on solid ground. The fallen knight looked all around, but her face was invisible – clad in helmet all around. The knight hesitated for a moment and she started fidgeting every which way. The knight hesitated again and fidgeted every which way, it seems she was really embarrassed by the next thing she had to say. She pointed her finger at the prince with a beautiful face – and then cupped her right hand to her heart with a bow. The prince could only nod in response. “Yes, it was. It really was, okay?” The knight breathed a sigh of relief. The knight nodded once in reply. With that she drew her sword, which glistened in the light. It was bluish and translucent and seemed to shine from inside with a faint glow of pinkish light. The prince waved farewell to the red and white knight, the one who was deathly afraid of heights. She ran through the forest swinging her sword of pink light as she slowly disappeared from sight. Suddenly, the prince’s eyes lit up with delight, his trusty steed had stood upright. “Dear friend! I’m so glad to see you’re okay…” he paused and looked to the path that the knight had made. The horse replied with a contented neigh. I see a lot of people vent-posting, so why not? Also, read the whole post before you drop any of your pearls of financial genius wisdom on me -- genius. I'm posting to vent, not to ask for your unsolicited, unwarranted and probably annoying financial advice. Also, please don't include me in your prayers. I am an atheist and your prayers aren't going to change my mind nor "help" me in any tangible way whatsoever. Furthermore, do take note that I live in a country wherein social welfare is realistically nonexistent and what happens if you can't make enough money to feed yourself or seek medical attention for serious injuries/diseases is that you die. If you live below the poverty line (which I don't), you'll probably die sometime anyway as target practice for the motorcycle assassins currently prowling the streets for anyone who even looks a little bit like a drug addict. So... this is more or less what my bank account looks like near the start of every month (1 usd = 55 php so what I have here is a little less than 45 USD) -- and it's going to look this way perhaps for as long as I live or even worse, at least from the foreseeable future. Now allow me to explain. This isn't my secondary bank account -- it's my primary and only one. I do not have social insurance. I do not have third party insurance. I do not have health insurance. I do not have any sort of long-term investments. This bank account is my one and only source of liquid assets. I live off of my salary as a freelance virtual assistant which is 5,500 php a week or 22,000 php a month. Aside from the food, internet, cable, and half of the electric bill, there are also some unexpected expenses that pop up every other month leaving me with more or less around 3,000-7,000 php a month. This month, there were a lot of expected expenses for the maintenance of our car and the renewal of its annual insurance policy, so it fell below the 3k line for a bit. I once took out some kind of long-term investment/insurance scheme for 3500 php every quarter, but I found that I couldn't handle even that much, so I pulled out and since I hadn't paid off the threshold for the premium, I got nothing out of that. I just ended up paying 10,500 php to the insurance company. So yeah, the bottom line here is that I'm in a position wherein I'm not realistically able to make any long-term investments for the future since I can't handle any more regular monthly, quarterly, or even annual expenses and I'm not and never will be in the mood to kill myself by working extra jobs on the side just to earn a little bit more loose change for personal expenses. So what's my next step? I dunno... maybe I'll buy that one video game for the PS Vita I saw online (around 1000 php). 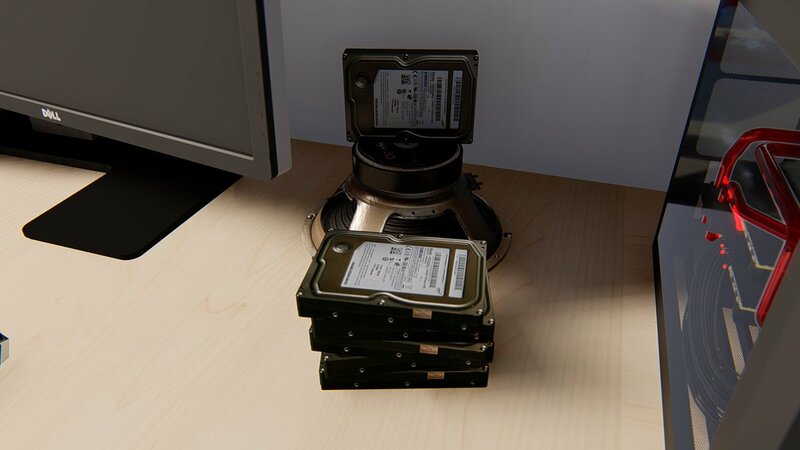 Wait... why am I thinking of buying video games, you might ask? Well, duh? As I said, I'm not in a position wherein I can change my financial situation realistically and none of your pearls of wisdom are going to be of any help to me (really, do you think I haven't thought about what you're going to advice me before? I've been there, done that, seen it all, so shut up and keep reading.) -- so forget about it. The truth is that I'm not at all dissatisfied with my current situation. After all, the financial aspect aside, why would I be? I work some reasonable and very comfortable hours at my leisure because my employer allows me to do as I please with my time as long as I turn in quality output. We've known each other online for years and I'm a very valued and trusted colleague to her -- even if she can't pay me as much as a larger third-party business. I can actually afford to eat out every single day and even have money leftover to buy an anime figure/ a video game, or some other premium item every other month. I don't like brands/brand-name clothing/brand-name gadgets like Apple, Samsung, Oppo, Vivo etc. I'm actually quite satisfied with a Cherry Mobile or some no-rep chinese brand that offers medium to high-spec phones at low, low prices. I have a good backlog of games to play and anime to watch. 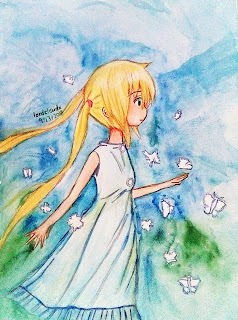 I can buy (most) artist-grade art supplies and have ample time to paint/draw the things I want to (mostly Nagi). My Nagi Sanzen'in figure collection is complete except for some very hard to find garage kits (unofficial third party figures). I have relatively stable internet at home and I sleep in an airconditioned room in a very large house for just two people. 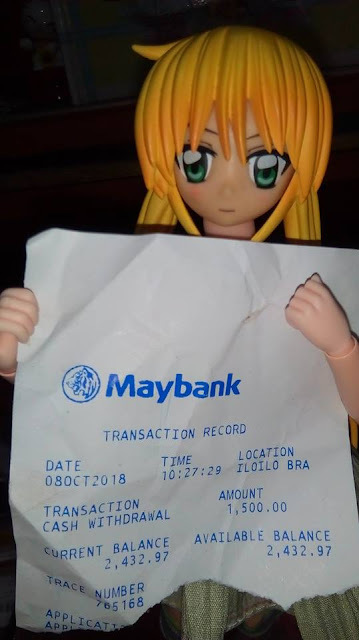 I drive a top-of-the-line (for Suzuki) car that handles very well and that I've customized with a peeking decal (1000 php for two large decals on the side windows) of mai waifu using my own CG art. I wear custom-made shirts featuring my own art every single day of the week. I don't have a family to support. I don't have a pet, I don't have nor need a social life, I have no friends IRL and I only talk to a select few acquaintances from all across the globe online. I don't dream of traveling the world nor owning a large mansion -- (our house already counts as one anyway) and I've never really felt the appeal of traveling to other countries. Unlike other otaku, it has never been my dream to travel to Japan nor am I even interested in local conventions. I can continue to write my stories that no one (actually, at least one person. Thanks, Roop.) ever seems to be interested in reading (or at least even feels like letting me know that they enjoy reading them) and keep deluding myself that I'm actually a pretty competent writer. Most of all, I'm fit and healthy and I don't have a bulging potbelly like a lot of other people who let their bad habits get the better of them do. So why would I be dissatisfied? Sure, I could always use a little bit more money than I'm actually making right now -- but the same is true for everyone. It's all a matter of perspective. Life has been unusually busy -- and not in a good way. Anyway... have a video and fanart. Like I said, I've just recently discovered how fun Mobile Legends can be. I'm pretty sure other heroes are fun and all, but for now I enjoy using Layla. Layla Nagi will drive away the darkness! Six days had passed as the prince followed the trail of the golden fireflies. There was no end to the path in sight. So much so, that he was starting to believe that the girl had lied. Before long, it was already the sixth night. He thought of how much he loved his would-be bride. The princess clad in black attire whom he had fallen in love with at first sight. Suddenly, on the road ahead, he saw a man lying down… was he perhaps dead? There was a girl in a thick black cloak by his side. She was ever so slight that the prince missed her form at first sight. “Uh… oh-“ Underneath her cloak, the little lady hid behind. In his heart, the prince would really have desired, for the kind little lady to stay for a while. With that said, he knew that he too had to go forth and ride. And continue his quest for his elusive kidnapped bride. On and on he galloped on his steed of black stripes and pure white; chasing the trail of the golden fireflies. Before long he had finally arrived. At the entrance to the Forest of Lies – although it was not much of an entrance all entangled with vines. Meanwhile, at the castle on the hill past the forest of lies. Some chatter was going on between the witch and the princess in black attire. At the witch’s innocence, the princess smiled. The princess’ eyes had a mischievous spark. At the Princess’ musings, the young witch smiled. The princess looked into the young witch’s eyes. I like how this one turned out. This is a hand-sized card and painted with Bento Picasso watercolors. I've been playing Mobile Legends Bang Bang (lol at that "Bang Bang") lately, so you might see Nagi in Layla cosplay next week. On his steed, the beautiful prince rode in haste, to find the Forest of Lies without waste. He rode for awhile, for days on end, until he came to a foreign land. He asked this of an old, silver-haired but somewhat well-built man. Deep inside, the prince was quite touched – at the fact that he had been called a lad. After all, as you may be well aware, he was always being mistaken for a lady with his feminine face and skin so fair. And so, the two chatted for a while and before long, morning had given way to the night. The prince nodded to confirm that this was right. The old man stared at the prince with scrutinizing eyes. Suddenly, a wooden cup flew by and hit the old man on the head, which did not disturb him, he was sleeping quite tight. It had come from a lady, or perhaps a mere child. Who was clad from top to bottom in a cloak of red and white. But at that moment, the owner of the tavern held the prince and the girl by the cuff. And thus, they were promptly evicted, because drinking for minors is strictly prohibited. “O-of course not.” Was her prompt reply. The prince turned his eyes to some buzzing lights. With that, the girl hopped on top of a giant rock to supplement her lack of height. Just a video of me using my White Nights watercolor set to paint Nagi using washes for a negative painting technique and finishing up with hard outlines. 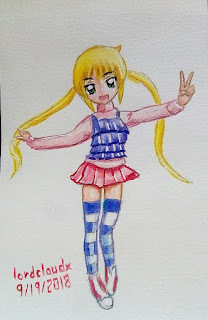 Hayate Reflections: For The Hina Shippers! 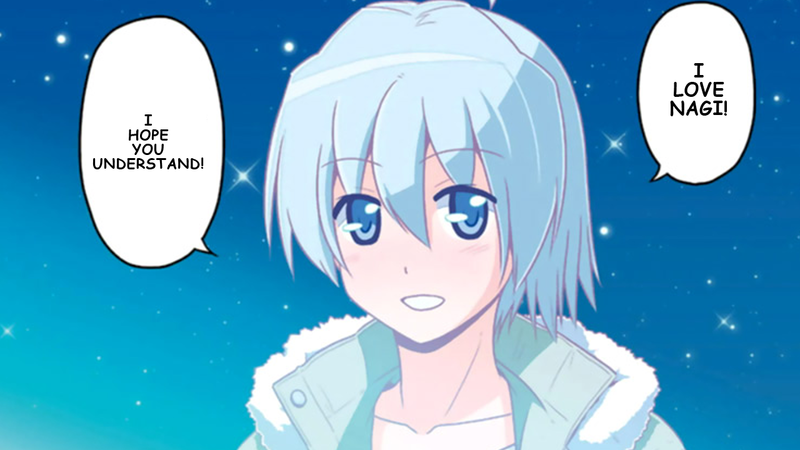 So it has come to my attention, that a lot of Hina shippers, which of course, doesn’t necessarily apply to all Hina fans, are quite dissatisfied with the ending of Hayate no Gotoku! Because they claim that they at least wanted to see Hina’s confession scene. The way Hata handled it was apparently quite disrespectful to her character... well, ok, I’ll give you that. In fact, I agree with you. So for this week’s Hayate Reflections, I’m going to give you exactly what you want, enjoy! Yeah, like she said, how does that make you feel? Are you satisfied yet? I sure am. Hahahaha! 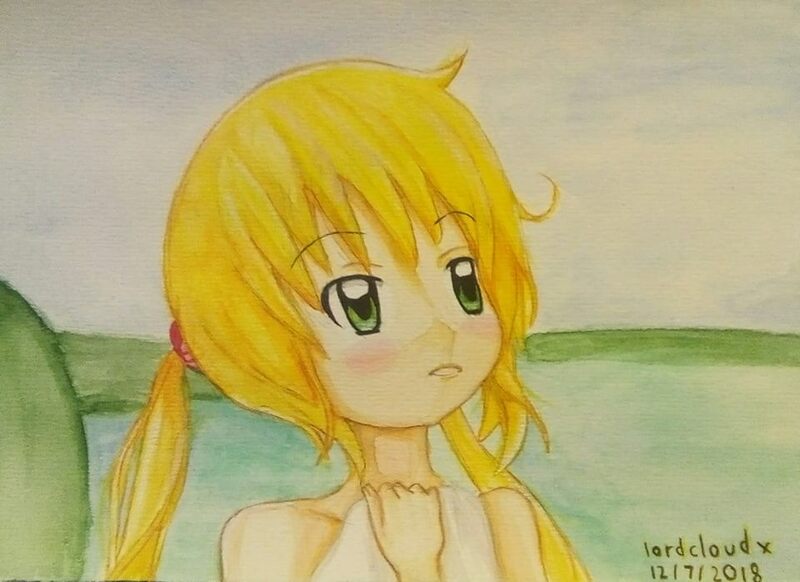 This is lordcloudx and this has been Hayate Reflections – sort of. I’ll see you next week for the third episode of the Prince’s Bride. The beautiful prince traveled to the lands beyond. On and on he rode on his steed of black slashes and pure white. Before long, he came upon a palace, or perhaps more accurately, a mansion of grand design. The place seemed abandoned, so he dismounted and carefully set the rusty iron gates aside. Perhaps the garden had a well for both he and his horse were thirsty and somewhat tired. He went around the building and circled to the right side, from there, he saw a well but something else filled his sight. It was a maiden of golden hair in a royal robe of the blackest of attires. His heart skipped a beat as their eyes met for the first time. “Ara-ara,” the beautiful lady responded with a mischievous smile. “Will you marry me?” The prince replied. For he was certain such a fine lady clad in pure-black attire, had to be a princess and was more than fit to be his bride. The journey to the black princess’s kingdom took them quite a while – and because this is a lore in medieval style, naturally, some bandits had stalked them and blocked their path with sly smiles. There were five of them and each with a dagger – surrounding the couple from all sides. The prince dismounted as his bangs covered his eyes. The black princess stared back at him with a look of surprise. This was the first time after all, she had seen his winsome smile. “Hey boss, I like the fair-haired one with the beautiful face, but I really can’t resist the buxom one in the black attire,” said another bandit as he ogled the couple with lust in his eyes. And of course, this remark had pushed the prince over the edge. With a kick, and a punch, and even a poke to the eye, without drawing his sword, he let his fists and feet fly. Ah yes, I forgot to tell you didn’t I? Actually, the prince can take care of himself in a fight with his feminine looks and charm aside. What is more, he was quite filled with rage at being mistaken for a girl all the time. And soon the prince and the princess rode away, leaving five half-dead bandits in quite a state of disarray. At the kingdom of the princess with black attire, the beautiful prince was accepted and well-liked. The kingdom had been ruled by the princess all alone for quite a while, due to an unfortunate accident that killed her parents in a fire. “Hah, not so fast! You princess with obnoxious breasts and black attire! You’re coming with me right now. Dare to refuse and you shall invoke my ire!” Said a loud, high-pitched voice, which came from a figure of small stature wearing a hood of thin animal hide. “C-c-child? I’ll have you know I’m a powerful witch with powers that will blow your mind! As for the guards, why not draw your curtains and see for yourself.” Said the witch with a glint in her eye and her witchy face concealed in her hood of animal hide. At this point, the prince finally spoke a line. The princess uttered this with an amused smile. The prince sank to his knees cursing his own helplessness from the inside, as the princess, his would be-bride, casually walked away leaving him behind. With that, the princess and the witch slowly disappeared from his sight – but not without turning back to wave bye-bye. “See you next time, prince.” The witch said with her high-pitched voice like that of a child. Greetings! To break it up a bit, I might do a regular Hayate Reflections next week instead of continuing this tale. In any case, see you next week for sure.